This retreat will focus on building the skills, networks and campaigns we need to create a just and sustainable energy future in America’s Heartland (draft flier attached). We will gather in the heart of southern Illinois to share stories, learn new skills, meet allies, and experience the beautiful Shawnee forest. The schedule and registration will be provided soon, but we hope you will set aside time in your schedule now. The different types of mining and the issues associated with with each. Lessons learned with SMCRA, NPDES and 404/401 permitting. The Retreat will take place Camp Ondessonk’s Retreat Center. Hostel style guest rooms with high-speed Internet will be available in the St. Noel Center. For the more adventurous are three-sided cabins in the forest built into the bluffs. And, for the truly hearty, there will be tent camping areas available as well. The camp offers a beautiful dining facility and a wide variety of gathering places for relaxing and continuing the conversation. Free time will be scheduled so that you can enjoy the beauty of mid-May in southern Illinois, and we’ll enjoy Carter and Connolley, Illinois’ “Preeminent Folk Warriors”, who have a gift for conveying environmental messages through their songwriting and storytelling in the most entertaining and engaging way. We look forward to continued collaboration both at our December meeting and May retreat. 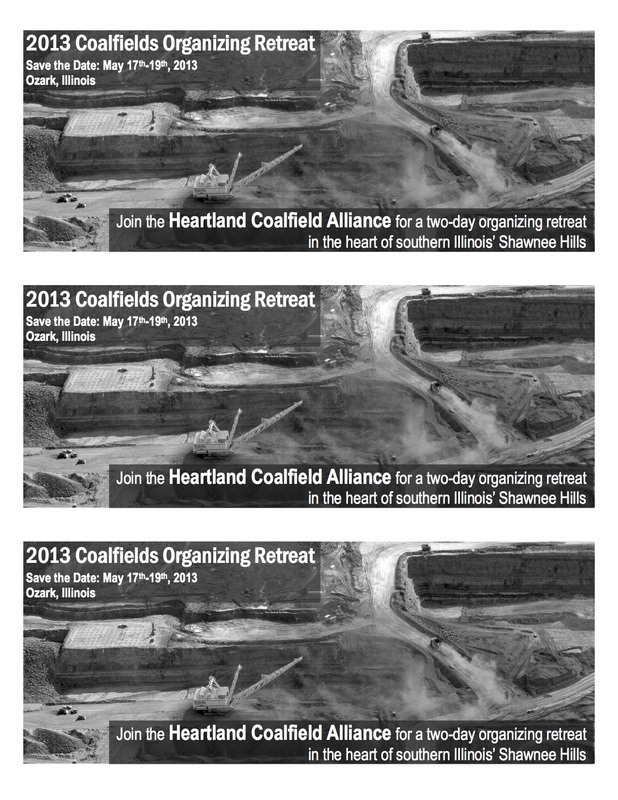 With your support and participation, the Heartland Coalfield Alliance can be a powerful force for change!